My race day started off with a 4:44 a.m. alarm, and unlike I usually do when early alarms go off, I popped right out of bed. Exhausted from a long week of travel for work I actually went to bed early Saturday night and didn’t feel like I needed the snooze button Sunday morning. All my race gear was laid out, so I was quickly ready to go. The first sign of a bad day struck when I grabbed my Garmin. The display screen was blank. I had just charged it the night before, but I think it went into it’s protected mode which I’ve had trouble with before. I pulled up the email from Garmin support on how to bring it back to life, but after I did it beeped that the battery was low. NOOOOOO! I had a minor panic attack before Ian calmed me down and assured me this wasn’t the end of the world. I was going to have to wear a regular stopwatch for the race and not have instant feedback on my current pace or beeps with mile splits at all the markers. I haven’t done an outdoor run without my Garmin or before that my Nike Plus wrist band in years. I convinced myself not to worry about it and headed toward the metro. I was really early, so there was barely a line for the porta potties. 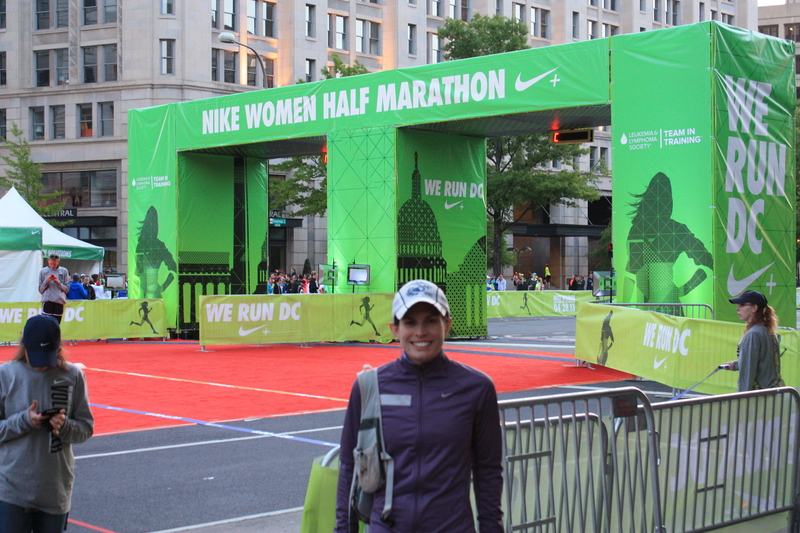 I was one of the first people in the 6:30-7:29 pace corral, which turned out to be pretty sparse. I had to go to the bathroom again, but stressed out about whether or not I’d have time so I decided not to go. 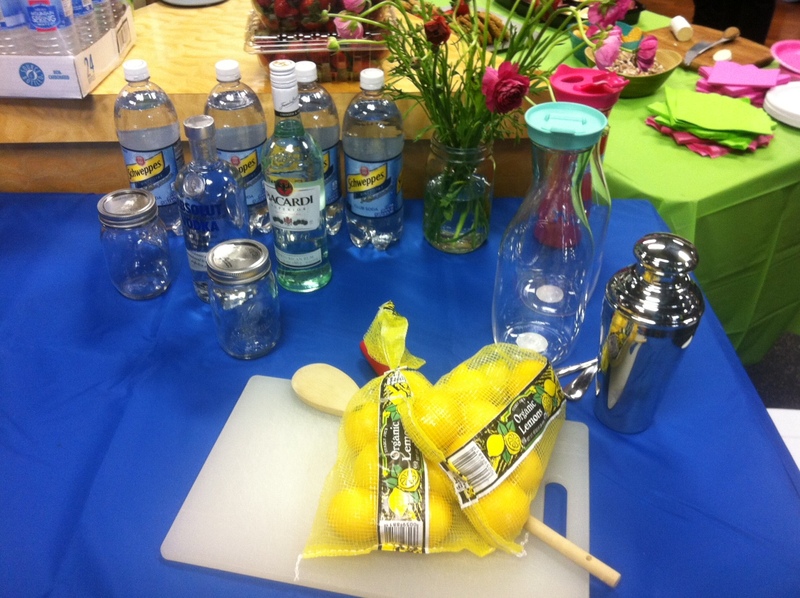 I think I might drink too much water on race morning sometimes. This was a bad decision and would come back to haunt me as I really couldn’t hold it anymore and had to find a porta potty just past the 10k-mark wasting about 90 seconds. Other than that little bit of TMI, everything seemed perfect for the start of the race. Temps were in the low 50s, so I wasn’t freezing like at the start of the Cherry Blossom, but it wasn’t going to be too warm to run in either. The Nike trainers kicked things off with some fun active stretches to get everyone warmed up and pumped up, and then to top things off they introduced Shalene Flanagan and Joanie Benoit Samuelson. The two both sporting Boston tees were going to “jog” the race with us. At the start, ready to go. 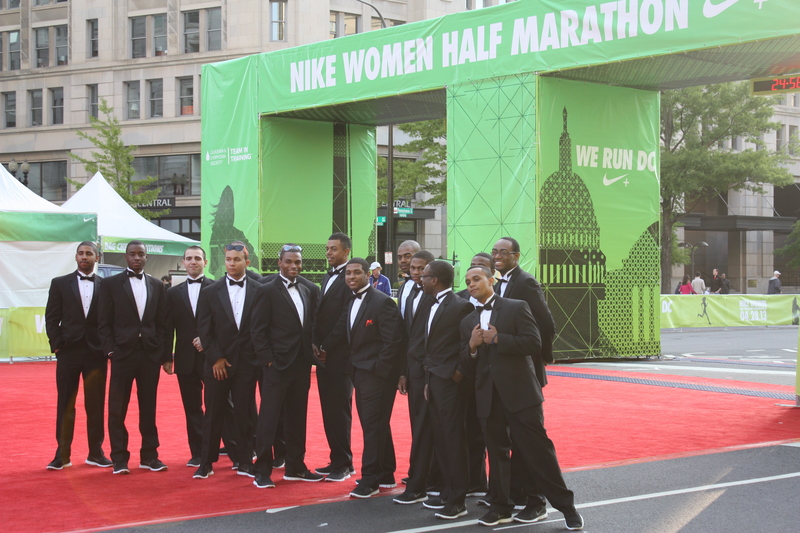 With so few people in my corral and even fewer in the one ahead of us, I was very close to the start line. I didn’t have any issues with overcrowding or weaving in and out of people at the start, which was awesome. I’ve heard some rumblings on social media that this was a bit of an issue for others further back however. We headed out for the first mile that led us through a tunnel with drummers and strobe lights reverberating off the walls pumping up the energy. 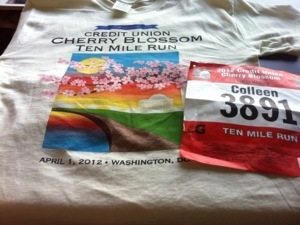 From there the course was very similar to the Cherry Blossom 10 Miler running along the Mall, out and back over the Memorial Bridge, past the Kennedy Center and through Hains Point. Right from the start something didn’t feel right. 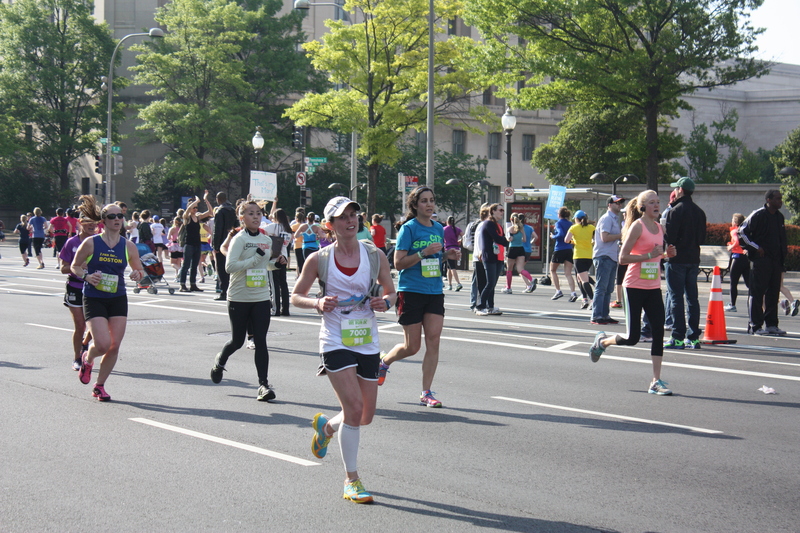 It was hard to breathe even during mile 1 – like that out of shape, out of breath I’m running way too hard feeling. I wasn’t running way too hard though. I ran my first mile right on pace in 7:30 and my second at about 7:27. It felt hard though. Really hard. I desperately tried to stay positive though, and told myself it was good that I wasn’t going out too fast. 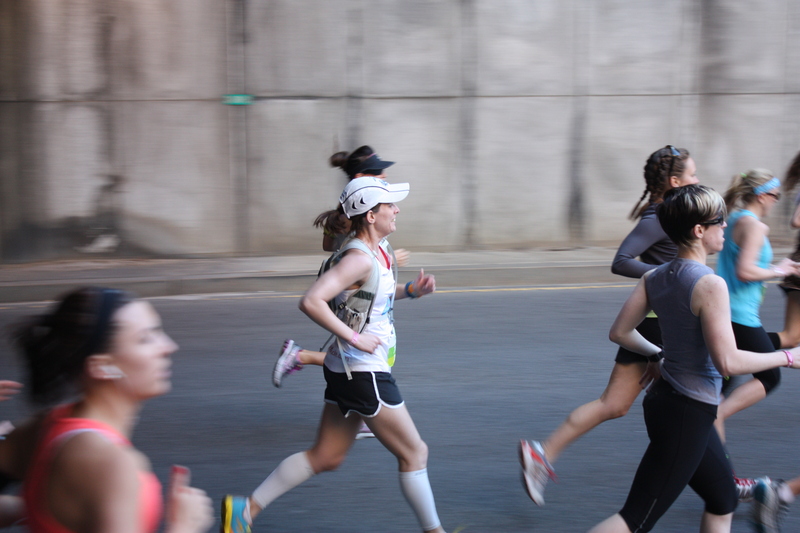 I didn’t want to let my mind beat me when I’d trained so hard for this race. My next two miles slowed to about a 7:50 pace even though I felt like I was pushing to keep at my 7:30 goal. Again I told myself to stay positive and that I still had energy in the tank to make up for it. This was not a fun way to run. I wasn’t taking in any of the sites or enjoying the bands and cheer sections along the course that were all really great. Point! Instead I got even slower. 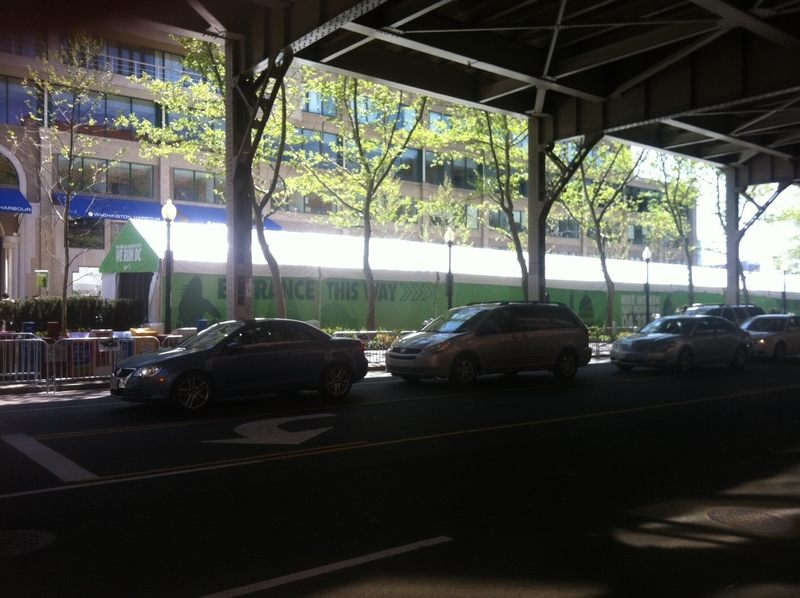 Nike did a great job of filling this four-mile-stretch with motivational signs that I tried to use for motivation. By mile 9 though, when I realized I’d slipped well below an 8-minute pace and was only slowing more, I almost broke down and cried. Leading from start to finish…wow! Mile 10 brought the first real hill up an on ramp, but it wasn’t even that tough of a hill when you think about the course for the National Half Marathon also here in D.C. At this point I wanted to just run off the course and hide somewhere to stop the struggling. Mile 11 brought us back through the tunnel and into the final stretch down to the Capitol Building and back towards the finish on Pennsylvania Ave. 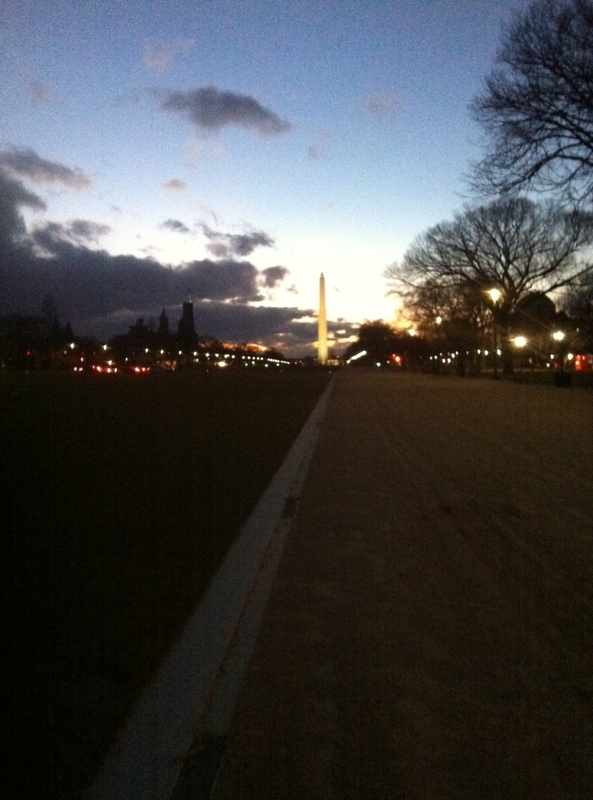 I swear that loop around the front of the Capitol took days. I saw Ian just after the 20k mark and tried to smile as I ran by, but just wanted this race to be over. Just get me to the finish line! You can see the finish line of this race from a long ways away. The fact that I didn’t have any energy to even kick to the finish made it seem like I was never going to get there! I did finally cross the line though and got high fives from Shalene and Joan Benoit – the highlight of my day. I broke down a little when I saw my friend Lindsay who was handing out water at the finish and told her I felt awful and had a terrible run. Being a runner she just gave me an understanding hug and told me there’d be another chance for a PR. 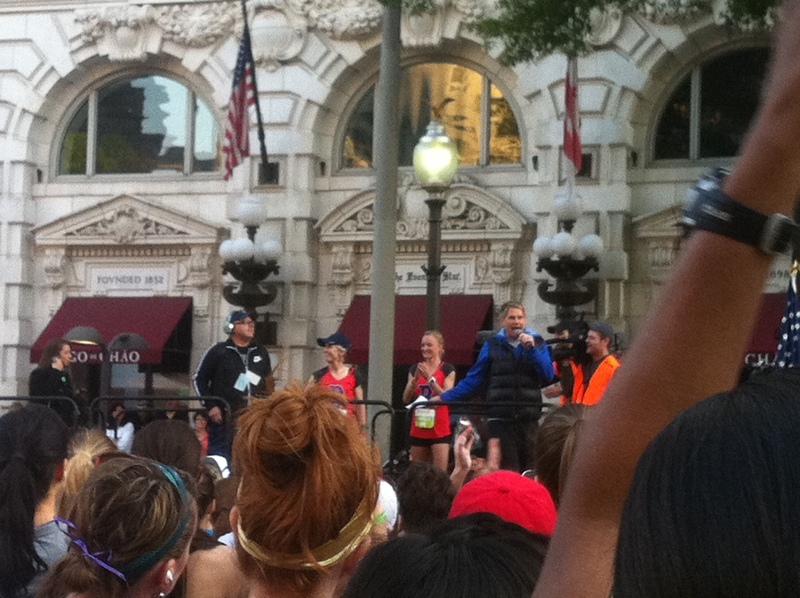 Only highlight of the race…getting high fives from Shalene Flanagan and Joan Benoit Samuelson at the Finish! 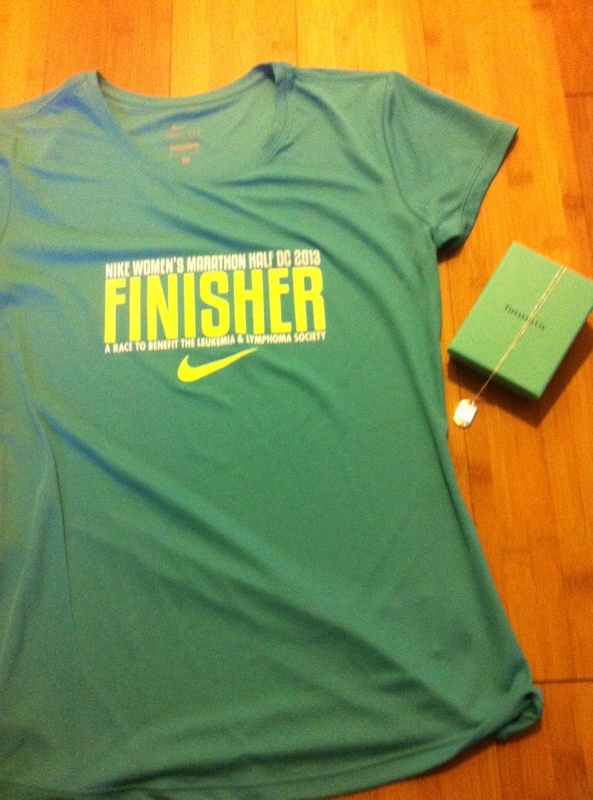 I kept moving through the finish area collecting my Tiffany’s necklace from the ROTC guys in tuxedos and then grabbed my super cute finisher’s tee. Well done Nike. I met up with Ian and immediately lost it and started sobbing in his arms. I realize this is a ridiculous reaction to not getting the time I wanted, but I was exhausted emotionally and physically and it just came out. 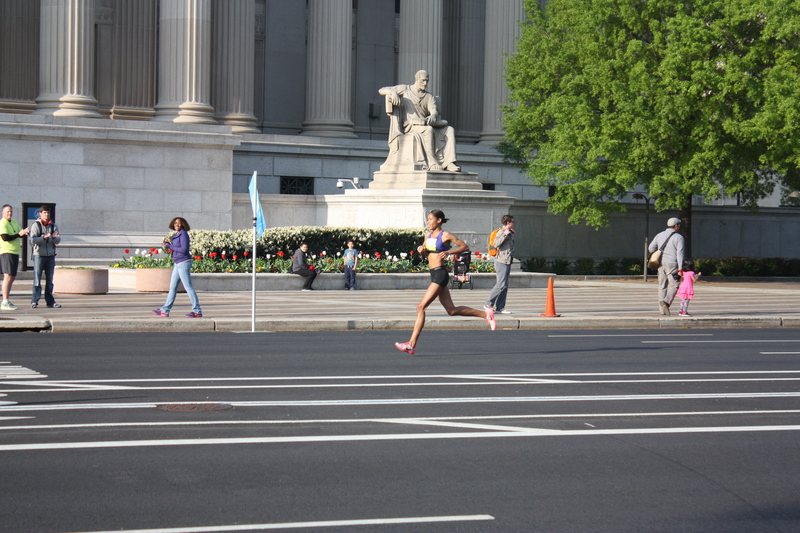 I’d trained so hard for this race and was really disappointed that I’d had such a bad day. It wasn’t just that I was mad about my time on a day and a course that were tailor made for a PR, but that I’d hurt for the whole race and hadn’t enjoyed any of it like I usually do on race day. ROTC guys getting ready to hand out Tiffany’s necklaces to the finishers. Kudos to Ian for getting them to do the prom style picture! I had a goal of finishing in 1:38 and ended with a time of 1:47:48 putting me in 812 place overall and 236 out of 3,744 in my division. It’s funny how relative running can be. A few years ago I would have been over the moon with that time, but after the training I put in, I know I could have done much better. In the grand scheme of things it’s just a race time. Nobody other than me really cares what time I come in. Even my goal time wasn’t going to win me any awards. I finished another half marathon and that’s something to be proud of. Also, one of the best things about running is that there’s always another chance. 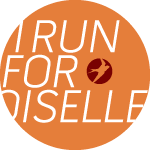 I’m thinking about adding in another half marathon to give it another shot, but am trying to give myself a few days to see how I feel before jumping into a new race. 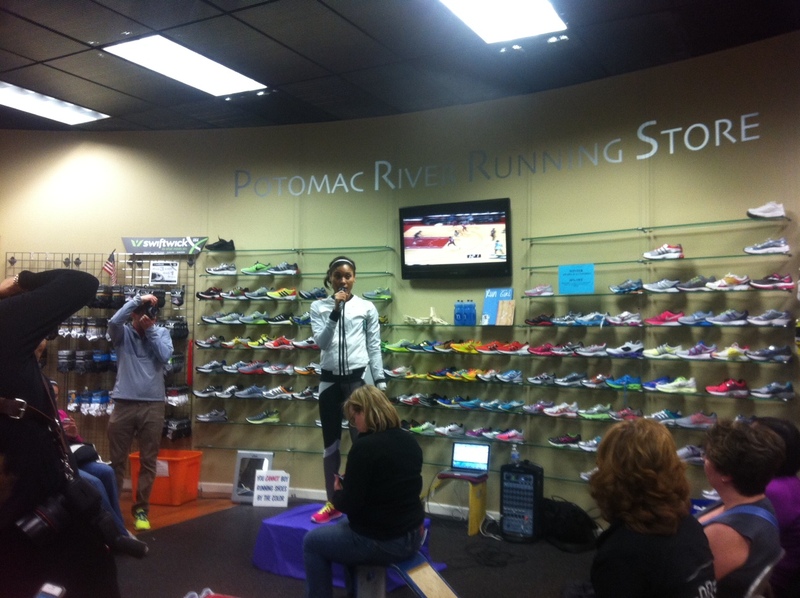 I’m looking at the half in Alexandria on Memorial Day weekend or the Zooma half in Annapolis on June 1. Has anyone done either of these? What are your thoughts? How do you deal with a tough race? I can’t even believe my half marathon is TOMORROW! It’s time to put so many weeks of training to the test. I’m not particularly thrilled with my last two weeks of training, but am hoping the foundation I built will be strong enough to still go for my goal. 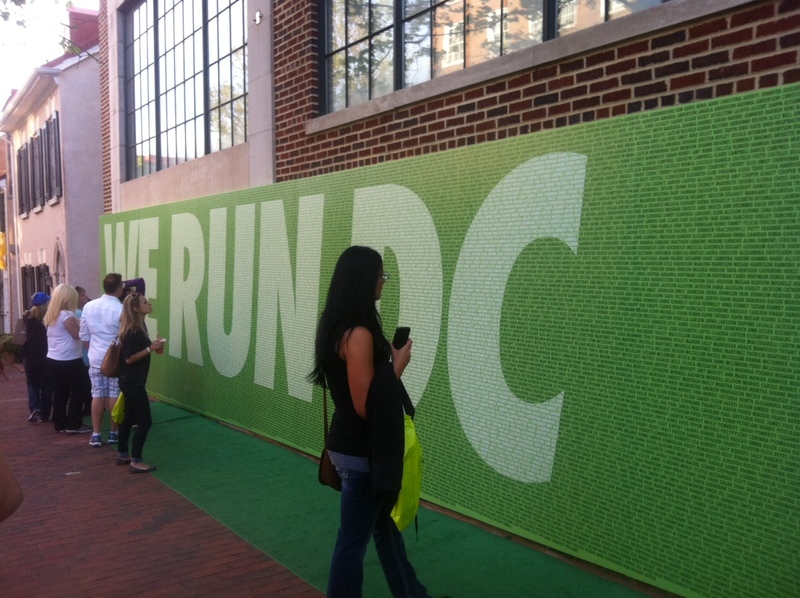 Yesterday I headed into Georgetown for packet pick-up and the expo, and thought it was a great experience! Ian dropped me off around 3, and I headed straight to the packet pick-up tent since I’d volunteered to help out for a shift there. 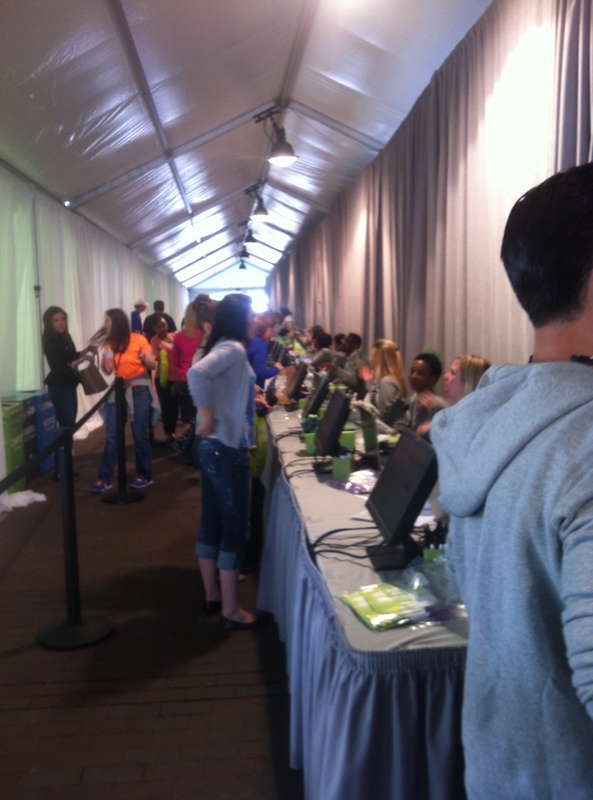 I was really impressed by how many volunteers they had an how organized it was. No matter how many people poured in, there never seemed to be much of a line if any at all. I got my volunteer shirt, went through a quick training session and sat down at a computer to check runners in and assign their bibs for the next three hours. The time flew by. It was really fun to see how excited everyone was for the race. Before leaving I picked out a bib for myself and saw that I may have been a bit ambitious when I registered placing myself in the 6:30-7:29 pace group. I’m hoping for a 7:30 pace so I’m debating whether it’s smarter to start near the back of this group or drop back and start at the front of the next group. It’ll likely be a game-time decision. From there I headed to the Expotique on the Waterfront. I thought it was pretty cool. It was fun, loud, energetic and crowded once I entered the tent. I breezed through pretty quickly since I was starting to get hungry and had a dinner date with Ian planned at Pizzeria Paradiso coming up, but I did make time to stop and test out several of the Nuun Hydration flavors. They were all pretty awesome, but I especially liked the Cherry Limeaid and Fruit Punch varieties. You could also get a quick hair style from Paul Mitchell stylists and a free makeover with Bare Minerals make up – the only kind of make up I wear. I love the natural look it gives and the fact that it never feels caked on. I took my card from my packet that gave me three chances to win Nike shoes and gear and tried my code on all three walls with no luck…bummer! 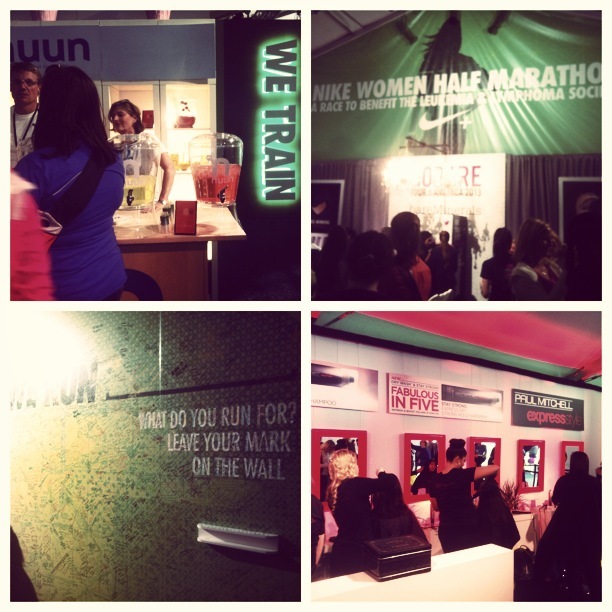 Then I took a quick look at the wall of sneaks, selection of sports bras and inspiration wall where everyone was free to write why they run on it. 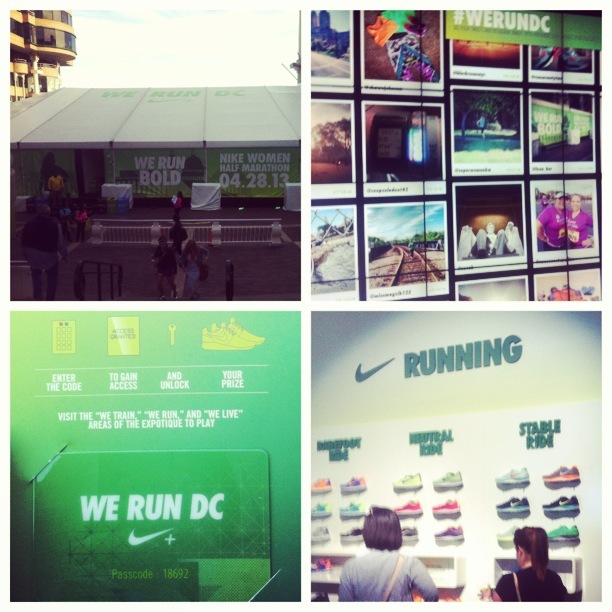 There was still more to see at the Nike Store, so I made my way up Thomas Jefferson St. towards it with a stop at the We Run DC wall. This was so cool. It had the names of every participant on it. I even managed to spot mine! 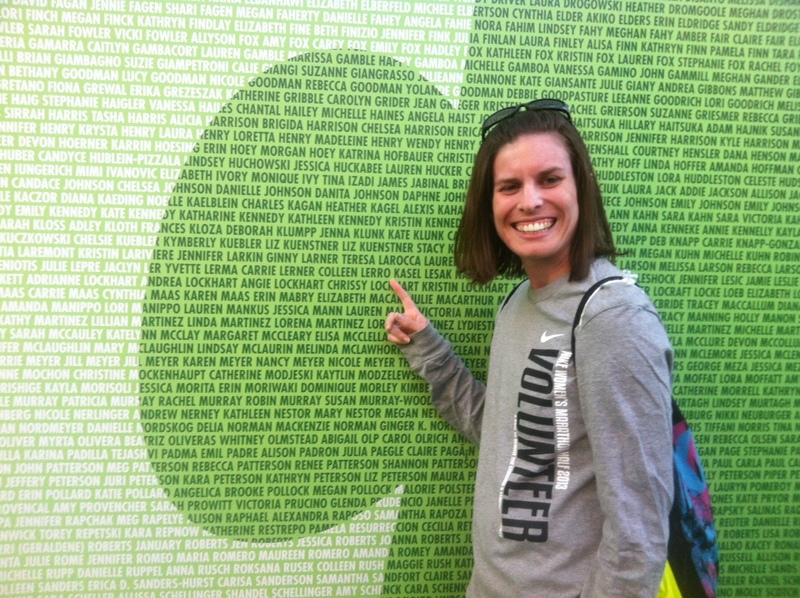 Finding my name on the We Run DC wall! The Nike Store in Georgetown is pretty great with three levels of awesomeness. They even had a DJ in the store. It was a mad house and they had tons of NWM DC specific gear. I found a black tank with the DC race logo on it. I actually have the same style tank in three different colors so I knew what size to get and knew I’d love it! During my Sunday stop at Pacers to pick up my Gu and Body Glide for the race I asked about the special Tiffany Blue Nike Frees I’d heard had been designed for this race. They only had one pair of size 8’s left in stock…my size! I figured it was a sign I just had to get them. Now it’s time for some spaghetti and meatballs and hopefully an early night! Good luck to everyone running tomorrow!! See you out there! 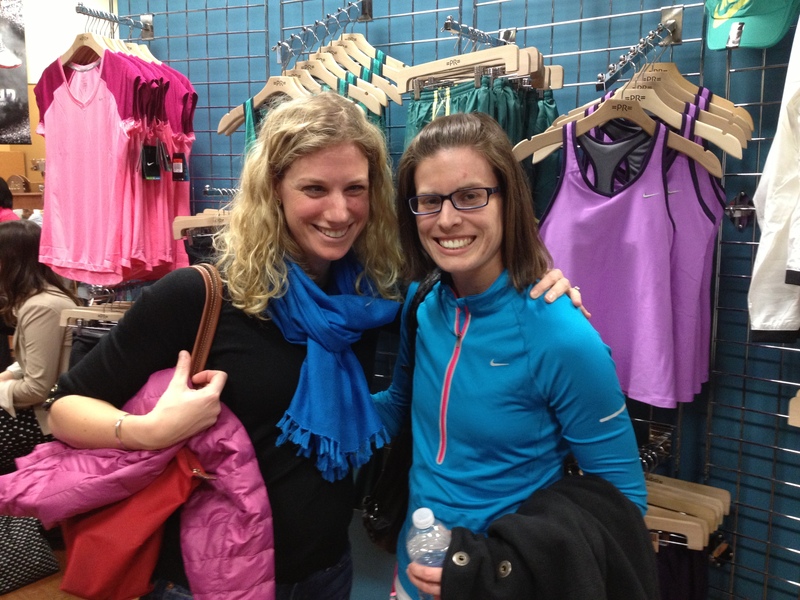 My friend Lindsay and I headed out to Potomac River Running’s Tyson’s store Thursday night for a special Nike Just for Her VIP Night. We’re both planning on running the Nike Women’s Half in D.C. next month so we figured this would be a fun, pre-race get together. I had really good intentions of cranking this post out Thursday night so it’d be up Friday morning, but I was too nervous watching the Syracuse game that night and too fired up after they beat one-seed Indiana to be able to focus on writing! I’ve been to similar events before, but this one was by far the best yet – they did a really good job. The first 30 RSVPs to show up received free Nike swag bags, but despite being there fairly early we didn’t stand a chance since apparently some people showed up hours early. We filled out some surveys to give Nike some feedback for a chance to pick a plastic easter egg that might reveal we won a prize. No luck there either, but we quickly turned our attention to the table where ladies were mingling about and enjoying wine, nuun cocktails and snacks. 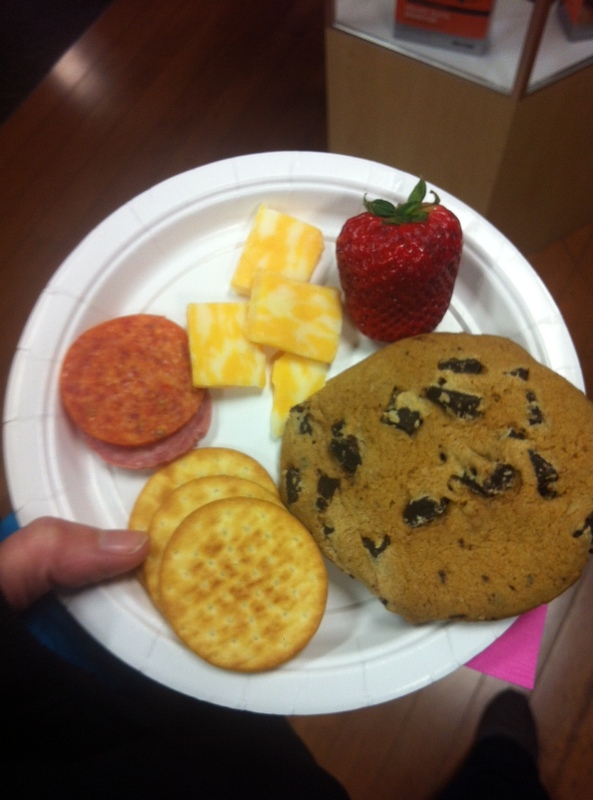 I wasn’t in the mood to drink anything so I just grabbed a water, but I did load up on some snacks! We had a bit of time to wander around the store and check out all the great gear. You could even sign up for free massages! I drooled over the Nike wall of gear for awhile before deciding on a few things. To enter the raffles you had to buy something Nike from the store. I wish they’d let everyone get at least one ticket for free and then gave more entries to people who purchased items, but that was really my only complaint of the night. I managed to find a few things I really wanted anyways and since I just passed the $50 mark, I got a free pair of Nike performance socks to go along with them! 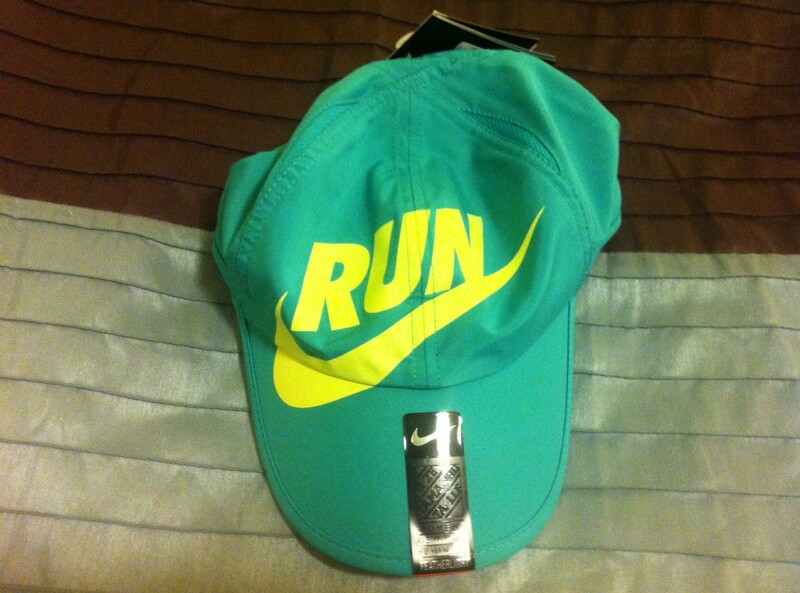 I picked up a great new Nike running hat. Let’s just say it was time – my white running hat I’ve been wearing since training started for my 2011 Twin Cities and Marine Corps Marathon races is getting a bit worn. I also got a new orange top that is identical to ones I already have in green and white. They are oh so comfortable and I love wearing them on the run or to the gym or spin class. I figured I’d go with Orange in honor of Syracuse taking on Indiana in the Sweet 16 later that night! 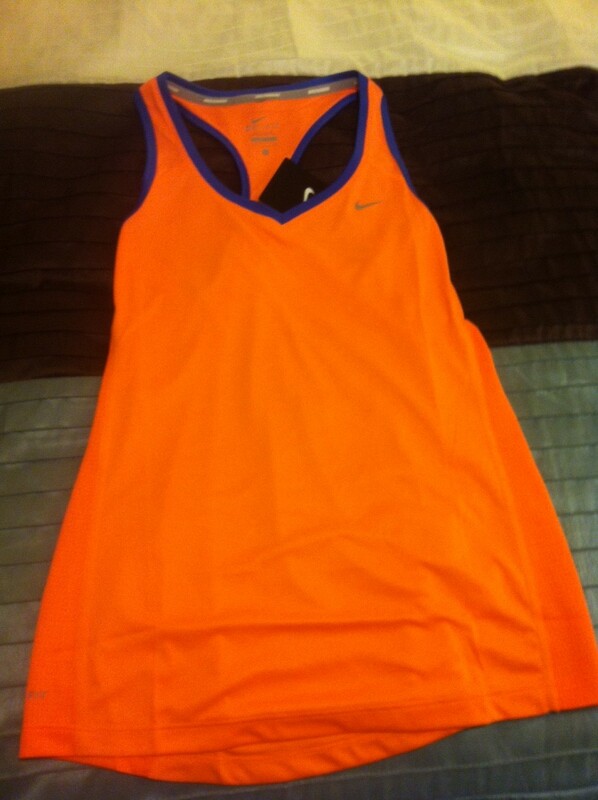 New Nike Running Top – So Orange! I’m so glad we made it out for this event. 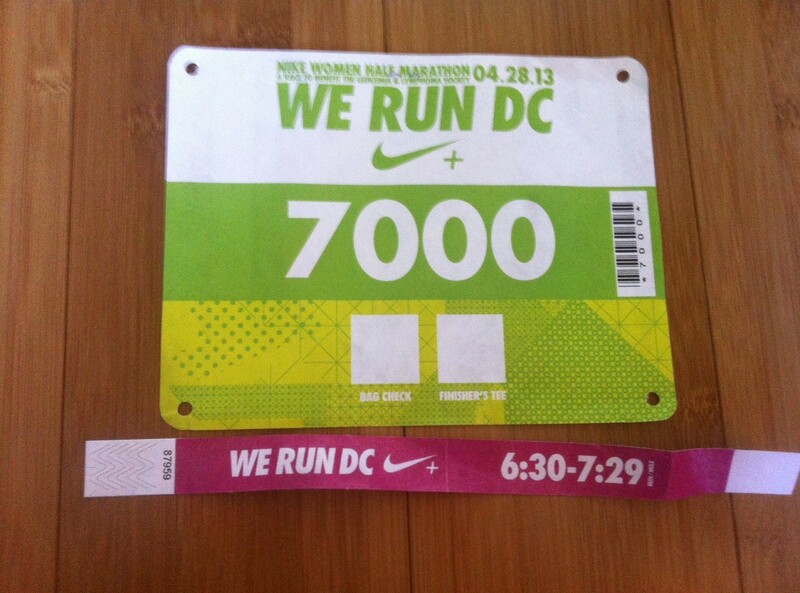 It was a lot of fun and I’m getting even more pumped for the Nike race now. I can’t believe it’s just a month away! 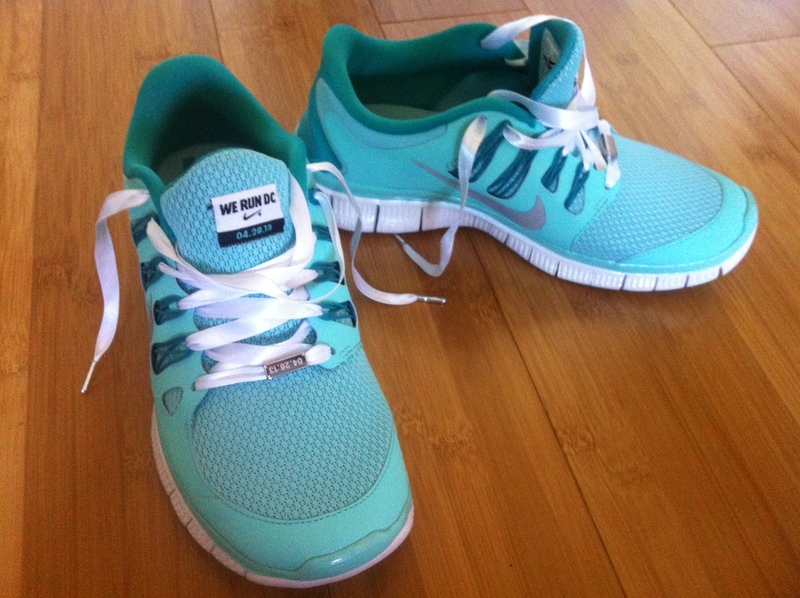 I LOVE running shoes. They’re one of my favorite things to buy. 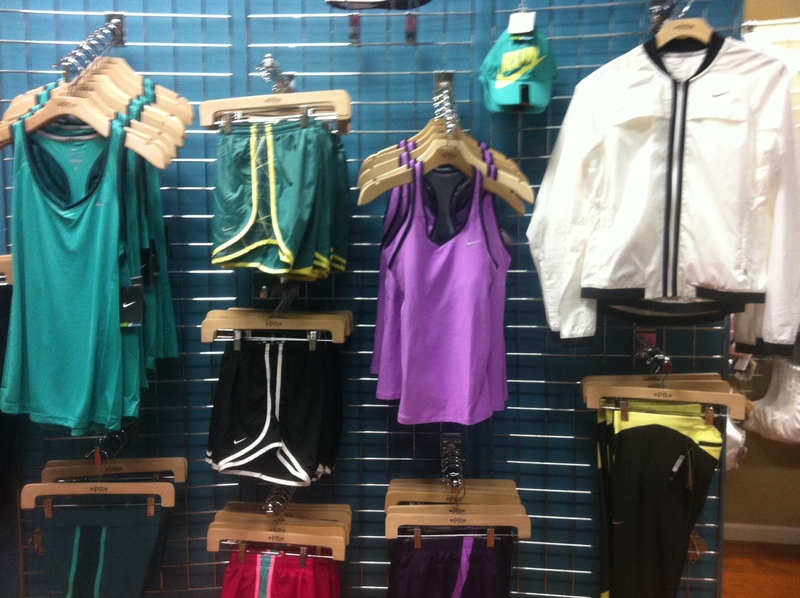 I think most runners would agree – you can never have too many in your closet! I currently have six pairs in my rotation. Two of them are probably ready for retirement, but sometimes it takes me a little too long to throw them out. I know this isn’t good for my legs, but sometimes I get attached! I’ve been wearing my Newton Gravitys and Nike Frees for the longest, so they’re my back up shoes right now. 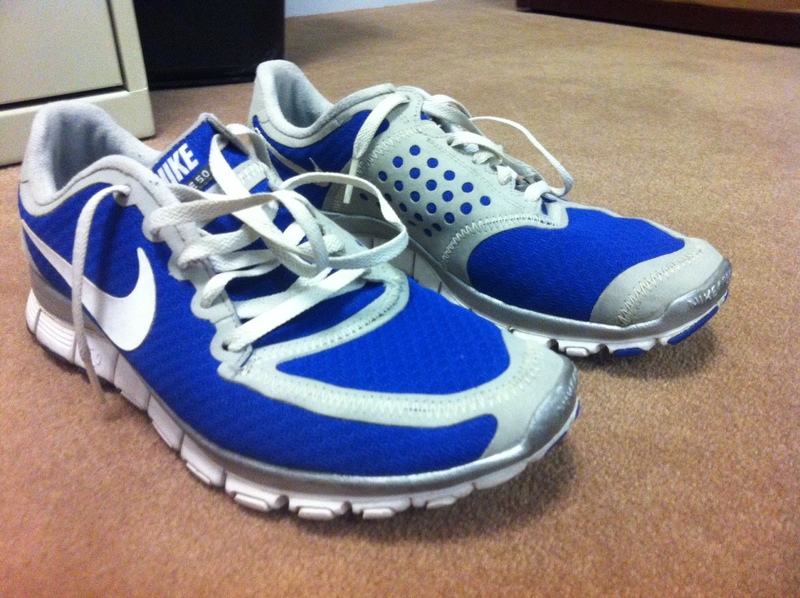 I leave the Nike’s at work in case I forget my sneaks and want to go for a run at lunch or at the end of the day. I left my Newton’s at home after Christmas so when I visit – especially when I fly – I don’t have to stuff a pair in my carry-on. Putting on my new Newton’s was love at first step. I got to try them out in a series of four Friday 5ks wear Newton reps showed up with tester pairs, but it only took 2 weeks – and 2 PRs – to win me over. They’re incredibly light and breathable. Like all Newtons they feature their trademarked Action/ReactionTM technology and a biomechanical metatarsal sensor plate. Check out the lugs on the bottom that make them so unique and while still providing cushioning, give you a very engaging and responsive feel making you more efficient and costing you less energy with each step. The sensor plate lets you run more naturally since it allows you to sense the ground better making your stride more efficient and more stable. These shoes are prefect for neutral, midfoot strikers like myself. They can also help encourage a midfoot strike if you’re looking to transition, but you should definitely take it slow and only run a couple miles at a time in them until you build up and strengthen the different leg muscles you’ll engage. Newton’s bright colors are super fun, and combined with their patented technology they make me feel like I have an extra bounce in my step. I ran my fastest 5k ever in them, and yet they also were supportive enough to carry me through a marathon (also a PR) and all the long training runs along the way to it. The Nike Free’s are super light and feel like there is barely anything on my feet. They’re also incredibly flexible. I think they’re a good first step into more minimalist shoes. Most of my runs in these shoes were on a treadmill since they were my back up pair at the office for when I’d fit in runs at the gym there. I was stuck doing most of my runs for that training season on the treadmill though, including three of my 20-milers (ugh!) so they saw plenty of miles. After wearing heavily cushioned shoes for years, I was warned to ease into these, but I loved the light weight barely there feel right from the start. Again, these are best for neutral runners. The heels don’t have a lot of cushion either, so if you’re primarily a heel striker these might not be a good move. Both shoes were great to me, so this is a tough call, but the Newtons win out. Both were pretty breathable, but the open air mesh upper of the Newtons dried a bit faster. The Newtons also force you to focus on your form a lot more. It’s easier to slip into a heel-first strike with the Nikes, which isn’t easy on the foot with their lack of cushioning. While any specialty running store would lecture me about not choosing a shoe based on color, the Newtons fun, bright colors are definitely a plus! Sometimes it just comes down to feel and my Newtons felt great on every run, gave me support without weighing me down and most importantly – made me feel fast!